Kangaroos on the track at Bathurst's Mount Panorama Circuit have been a big problem in previous years. So, race promoters have reportedly come up with the most Aussie solution ever: snipers. Sportscar365 reports that the snipers (ahem, "population control" for skippys) have been instructed to do their job as humanely as possible, only shooting when absolutely necessary. Snipers will be "strategically located atop the mountain" in order to prevent kangaroos from entering the Mount Panorama Circuit. Any animal hit on track is likely to cause a lot of damage, especially if they're hit on Mount Panorama's high-speed Conrod Straight. "Ballast of Possum" is one thing. Kangaroos are much bigger, and far less likely to be carried by a car into the pits. They're closer to hitting a small- to medium-sized deer. How prevalent are kangaroos at Bathurst? It's practically given that a roo will venture out on track at some point during a long race. At last year's Bathurst 1000, a kangaroo caused a safety car for hopping on track. Likewise, Peter Kox's Lamborghini was knocked out of the 2014 Bathurst 12 Hour entirely for hitting a kangaroo in the opening laps. Compared to getting obliterated by a race car at speed, being taken out by a sniper doesn't seem so bad. Besides, kangaroo meat is delicious. Hopefully, these snipers are providing fans down the hill with delicious skippy to grill. Patricia Driscoll, I think we've found your post-Busch-trial calling. 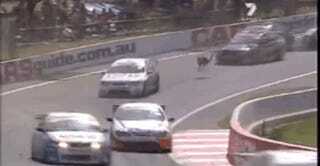 GIF taken from this video of the luckiest roo ever to hop into a Bathurst race.